Operational Efficiency - Is it a constant adaptation to the drivers of change? The PE industry has to rapidly adjust to more demanding investor reporting standards, tighter governance, and an increasingly complex regulatory framework and evolving operational requirements for standardisation and automation in PE operating models. Dealing with these challenges effectively requires close cooperation between the GPs and their key business partners and stakeholders. It is incumbent on service providers to have the expertise and tools at their disposal to ensure their clients are fully prepared for the future. 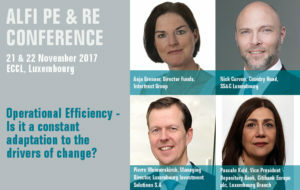 Don’t miss this deep dive and interactive discussion with the operational side of the PE industry at the ALFI PE & RE Conference on 21 November at the parallel workshop at 3:30pm. View full agenda of the conference.